Back in the days before the internet granted us access to fine review sites such as this one, deciding what horror flick to check out was a bit of a crapshoot. Sure, you knew you were in good hands with Michael, Freddy, Jason, or any of the other titans of horror; however, lesser-known films pretty much only had their box art to entice you. As any horror veteran can attest to, VHS art was much more imaginative than what we get with DVD. Every now and then, you’d come across a flick that really stood out on the shelf for whatever reason. Nightmare on the 13th Floor was one of those films for me. Boasting a cover with a silhouetted figure with an axe and a killer tagline (“scream bloody murder while you still can”), the film intrigued me enough to give it a rental. 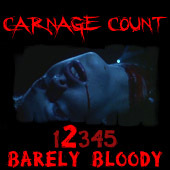 There’s no doubt that the inclusion of “Nightmare” and “13” in the title also had a lot to do with it, but the film ended up having enough merit to warrant multiple rentals. However, the film went on to languish in the back of my mind for a long time before I was recently reminded of its existence. Much to my dismay, I learned that the film didn’t have a DVD release, so I was forced to track it down through alternate channels because I wanted to see if the film still held up after all these years. Furthermore, I found out that the film was actually a made-for-television movie, so I was beginning to worry if my memory was fooling me. Could it have been as enjoyable as I apparently found it to be all those years ago? Nightmare on the 13th Floor has an interesting story that borrows a bit from a few different sub-genres. It concerns one Elaine Kalisher, a columnist for a travel journal, who has arrived at the Wessex Hotel to write a review. Everything seems normal enough: the amenities are impressive, the staff is friendly, and, most importantly, there are no mysterious deaths. The latter soon becomes untrue, however, as an elevator malfunction causes her to witness an apparent murder. The staff, of course, is skeptical, and even Elaine herself is unable to point out the floor where the murder occurred. Naturally curious, Elaine continues to pursue the case, especially when more disappearances take place. Her investigation soon leads her to the hotel’s hidden 13th floor that houses the secrets of a series of murders that occurred there near the turn of the century. Furthermore, it soon becomes apparent that the hotel’s staff is not what it seems, as they belong to a Satanic cult hell-bent on discovering the secrets of immortality by sacrificing the hotel’s unsuspecting visitors to a mysterious axe-wielding maniac. Surprisingly, Nightmare on the 13th Floor managed to hold up in the fifteen years since I last saw the film. Sure, it’s a low budget, made-for-television movie, but I appreciate a good murder and cult mystery; heck, it even throws in some slasher tendencies at some points. It’s not going to be mistaken as a classic anytime soon, but it is a well done film for what it is. Amazingly, the film can claim both James Brolin and Louise Fletcher as part of its cast; of course, good actors don’t necessarily equate to a good made-for-television flick—Invitation to Hell taught us that much. Fortunately, we don’t have an uninspired Wes Craven at the helm for this one, which already starts us off on the right foot. The direction here is nothing outstanding, but Grauman does a competent job that was no doubt compromised by the budget and broadcast limitations. Most of the set pieces are kind of bland, but the 13th floor boasts some nicely gothic set decorations. The film even has a good score, especially during some of the stalking bits that recall some of the more famous slasher films in the genre. Of course, this being a made-for-television film means you should brace yourself for a lot of dialogue. Because of obvious limitations, the film is compromised in the gore department, and that would be a problem if the film didn’t evolve into something more than a slasher film. The mystery aspect really saves the film, and, while it’s nothing we haven’t seen before, there’s something about an occult mystery that draws me in. The film even features a bit of a twist that, while telegraphed, works well within the context of the story. It also features its fair bits of cheese due to the dated nature of the film, but, all-in-all, Nightmare on the 13th Floor does a good job with of delivering a good film from a strong story. Ultimately, it has the ambition of a big-budget feature that gets compromised a bit by its production origins. Like I said earlier, the film is not currently available on DVD. Paramount currently owns the rights to it, but I’m not sure if it’s high on their list of priorities at the moment because it’s a fairly obscure film. In fact, I’d all but forgotten about it up until earlier this year. Horror veterans from the VHS days might remember it, and, for this reviewer, it’s worth the trip down memory lane. It reminded me of a simpler time when cover art and taglines were king as I searched among the hundreds of VHS tapes at my local rental store. I’m not going to go so far to say that it’s an under-appreciated classic, but if Paramount ever does manage to get around to it, it’s definitely worth a look. Rent it!